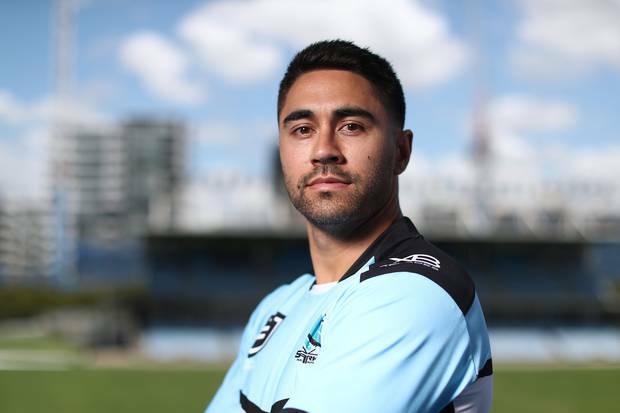 New Cronulla playmaker Shaun Johnson says Warriors coach Stephen Kearney "didn't like me" and complained that he was left out of the loop when it came to the Auckland NRL club's playing rosters. After going on the charm offensive and refusing to fire shots at the Warriors early on in his first interview with Sydney media yesterday, Johnson eventually revealed his relationship with Kearney had deteriorated long before he was granted a release last week from the final year of his million dollar contract. The 28-year-old detailed his frustrations about his time under Kearney - the former Kiwis coach who handed him his New Zealand test debut back in 2012 – over the last two seasons, and shrugged off recent criticism of his form and attitude from Warriors CEO Cameron George. "I've been there eight years and had six coaches. The sixth coach didn't like me. So what,'' Johnson told the Daily Telegraph. "I rode the tough times, I tried to keep fans engaged, I tried to play a style that got kids excited every week. "I know that, my family knows that, which is why I can say no, it (leaving) doesn't really affect me. The fact Sharks coach Shane Flanagan was open in sharing his plans for his players was appreciated by Johnson, who felt hurt that he was kept in the dark by Kearney and previous Warriors management over details regarding the club's roster. Former New Zealand test coach Kearney talks with Johnson at training during the Kiwis 2013 World Cup campaign. Photo / Getty Images. "You want to go somewhere and know what is going on with the squad and Flanno (Shane Flanagan) was unreal in letting me know the exact status of every player," he told the Daily Telegraph. "Like, when they're signed until and what they might be thinking. And I was a part of that discussion the first day I came over and that was really big for me. "I hadn't had a conversation like that at the Warriors for the last few years. I'd been left out of those conversations. "So to come here and be brought in and told 'you're going to be a in key position for us, you need to know what is going on around you', I was like 'ahh — thank you'." The 162-game veteran also raved that the Sharks have a more inclusive approach to leadership within a squad stacked with Australian and Tongan internationals and State of Origin representatives. Like any team's halfback, Johnson would be expected to have a loud voice, but despite being among the Warriors highest earners, he was not included in the club's leadership group this year. The side's most reliable and experienced performers - Johnson's halves partner Blake Green, former skipper Simon Mannering, and forward recruits Adam Blair and Tohu Harris – were appointed as Tuivasa-Sheck's lieutenants, while the hot-and-cold No 7 was allowed to focus solely on his roaming attacking role. "I'm still in awe of the experience the Cronulla Sharks have within their playing group. I was thinking about the leadership group, and your like, well who do you actually put in it? You've got so many players that have played so many big games for their country, origins, grand finals, whatever it is, that it can be so important to a side. "Talking to them over the last few days, everyone just contributes which is really exciting. I'll just be looking to do the same." Johnson poses during a Cronulla Sharks NRL media opportunity at Sharks Leagues Club. Photo / Getty Images. The Warriors have made it clear they held reservations about offering Johnson a contract extension due to his inconsistent form. In his eight seasons at the Penrose outfit, the club lost the 2011 grand final to Manly in his rookie season, but didn't feature in the top eight again until this year when they bowed out in week one of the playoffs following their qualifying-final defeat to Penrith. Johnson acknowledged the Warriors had played a big part in his development but admitted he had grown stale at Mt Smart Stadium. "The Warriors have been so good for me in that sense, building me, building me, building me, but I've sort of hit a plateau there,'' he said. "There's always things I'm improving in my game but just [not] that freshness side of things to really elevate yourself. I'm looking forward to it." Johnson also revealed that in choosing to sign with the Sharks on a three-year deal, he had declined an opportunity to join reigning premiers the Sydney Roosters in 2020, to succeed Cooper Cronk as the Tri-Colours' halfback. Canberra also expressed interest in signing him, but the Raiders were never really in the race, and the beachside surrounds of the Sutherland-Shire was always likely to be his new home. "The Raiders obviously reached out and the Roosters were appealing, but the Sharks with the roster and squad they've got, that's ultimately what excited me the most and where I felt I could add the most real value."